Moving to another country can be stressfull, especially when you do not speak the language, do not know anybody and are on your own. This is even more difficult when you do not have much online information like in the case of Cote d'Ivoire. We know well the feeling and will do anything we can to make that transition smooth. This guide is to help you cope with the basic daily things of life so you can have as much information on life in Cote d'Ivoire and quickly adapt. Abidjan is the economic capital of Cote d'Ivoire. It is located in the south of the country and is on the Atlantic Coast and the Ebrie Lagoon. It is a big city of 6 million people. Although being now the economic capital and Yamoussokro (250 kms towards the north) the political capital, it is still home to most of the main governement offices. Abidjan also has a seaport that exports mainly coffee, cocoa, cashew nuts and many others. 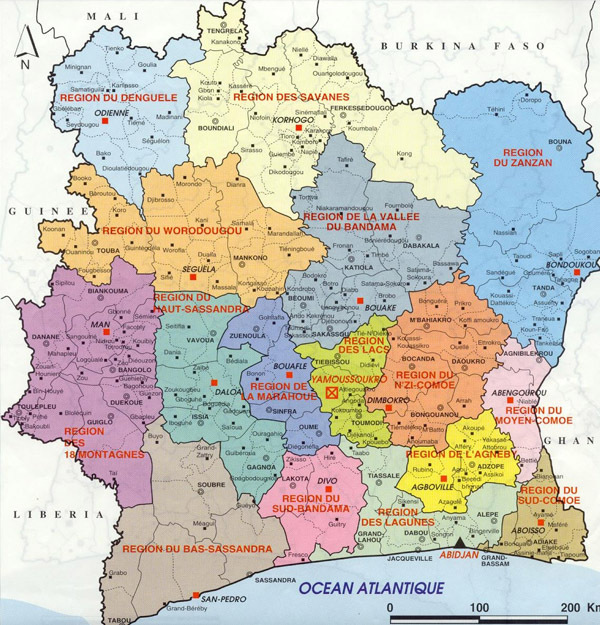 Abidjan was created in 1903 and became the country's capital in 1933 after Grand-Bassam and Bingerville. It quickly expanded trough the years and became the big city it is now. The official language is French and most people in the city speak it. Ivorians also develop some type of french patois/pidgin called "nouchi" that is mainly spoken in those populous neighborhoods. However with basic french you should be able to get around and find your way. Ivorians are very helpful people. The weather is mostly tropical with a rainy season between May and July and another short one between September and November with two dry seasons. 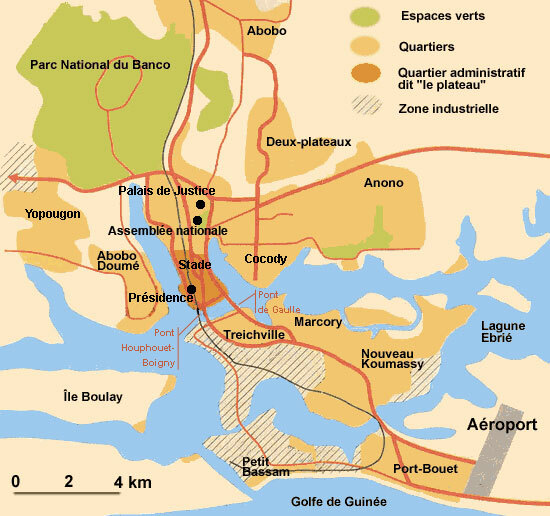 The average temperature is around 27 C/ 84 F.
The city is divided in two parts , the south and the north separated by the Ebrie Lagoon and ten communes with the greater Abidjan being an autonomous district. Cote d'Ivoire went through some political turmoil between the years 2002-2011. The first 3 months of 2011 were the most violent with some fierce fights in the city of Abidjan. As a result there are still many firearms in the city even though there has been real improvement since then. As for any big city, there are few basic security tips to apply when going around the city or even at home. In the city avoid big wads cash, avoid going to the ATMS late at night unless you absolutely have to. Watch your surroundings at all times. It is not recommended to drive yourself specially if it's your first time in the country. If you decide to drive be prepared for old and raggedy cars and fast driving. For security at home, the best things to do is to contract with one of the many security companies. Most of them have well trained agents and have been in the business for quite some time. Some of them even handle security for embassies, international organisations and many more. Most expats choose to live in the south due to airport proximity and the many conveniences stores necessary to an expat. The most renowned neighborhoods in this part of town are: Bietry,Zone Quatre,Marcory Residentiel. It is also closer to the main beaches of Bassam and Assinie. In the center you have the Plateauwhich is mainly downtown Abidjan.This is where you would find most government offices, banks and long time established businesses. There are very few property to rent over there and it is not very recommended due to safety reasons at night. The weather is mostly tropical with a rainy season between May and July and another short one between September and November with two dry seasons in between. Average temperatures are around 27 C/ 84 F.
The weather in Abidjan and the south is tropical with temperatures all year long around 25/30 C. There is a rainy season from May to July and another one from September to November. 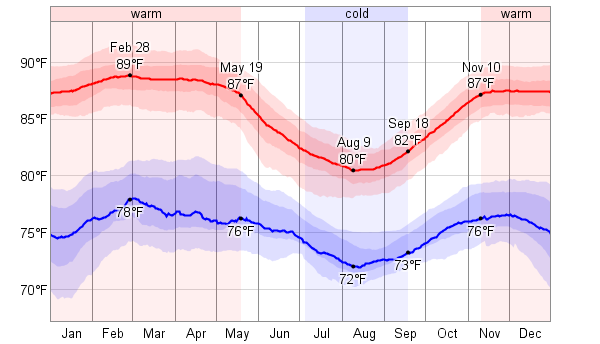 The temperatures are pretty much the same all year long in Abidjan. In january though temperatures are in the low 20's (C) and the weather is drier, it is due to the Harmattan. In the northern, temperatures are much higher with high in the 40's (C) during the dry season. In the western part of the country, temperatures are much cooler due to the mountains and the altitude. The country is about 40% muslims and 40% christian with the rest of the population being divided between traditional beliefs. The country is composed of almost 70 languages but the official language is French. There is no other official african language like most of the other african countries have even though some languages are more heard and used in markets like Malinke (Dyula) which is a language from the north. It is basically the language of trade. With basic French you should be able to get around. Ivorians are very friendly, open-minded and love to live. You will see many places very often in open spaces called "maquis". Those are local bars that cater mainly grilled fish, chicken and local beers. The local currency is the CFA Franc (XOF) and the exchange rate is 1 EUR = 655 XOF and 1 USD = 560 XOF as of July 2018. Observe basic safety instructions like in any other country and you should be fine. For example watch your surroundings when using an ATM, do not display wads of cash. Try to be as discrete as possible.